It is interessting that Moto-Rêve established at the same time in Genève, Rue de Lancy, when another there located succseful company, called Motosaccoche, moved to a new and bigger firm area in Genève. 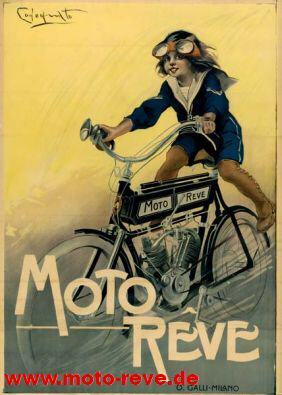 Mr. David and his compagnons founded in 1905 a stock corporation, called Moto-Rêve. The word means " Dreambike". It is assumed, but not proofed, that some engineers from Motosaccoche moved to Moto-Rêve to realise their dream of a V-twin engine. This fits, because the first Moto-Rêve model A was a V-twin that was placed in a bicycleframe without any change. In those days Motosaccoche only had a single cylinder engine in their program that needed a supporting frame to be fixed. Motosaccoche V-twin model C1 came 2 years later to the marked. In the magazine "La Suisse Sportive" Nr.369 you could read, that under the supervison of Mr. David, the boss of Moto-Rêve, the model A was constructed and brought to production in only 4 month. In May 1906 you could see the model A at the Salon du Cycle in Genève. It was a v-twin with 274cc with automatic inlet valve and 2 hp. The fueltank was rectangular, it contained 3,5 l gasoline and 1,5 l oil. With this shape of tank were aproximatily 400 engines built, most of them were put into BSA bicycle frames. From now on Moto-Rêve even made their own frames.